Well, I had intended to write long before now! I had a post all queued up about shopping for and preparing our first Thanksgiving dinner in Italy - but then that post became a combined “Holiday” post (Thanksgiving and Christmas) - which didn’t get written. So, I thought I’d write a combined Thanksgiving/Christmas/New Year’s screed - and somehow it didn’t materialize, either, alas. And here we are, in the middle of January, in a new year. Where DOES the time go?? But, let me back up. We’ve been living in Florence for 18 months now. How did THAT arrive so quickly?! It’s been an amazing, frustrating, nail-biting, nerve-wracking, wonderful, exhilarating experience. Above all, very edifying. And a great opportunity to practice what I preach: Acceptance & Allowing. Not our car - but it’s pretty darn cute! 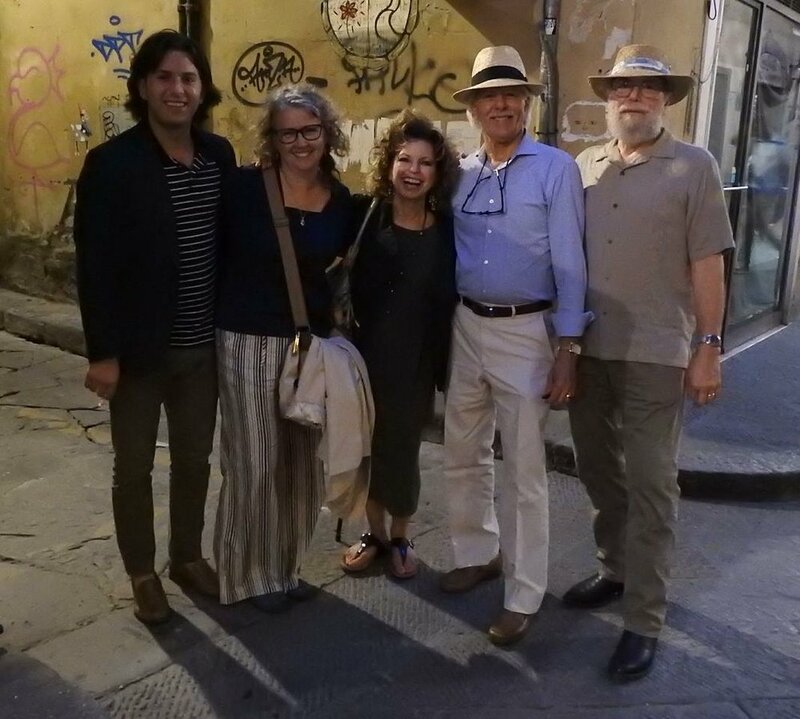 Our friends, Kathy and Steve Gleaves, had a very brief visit in Florence. We were thrilled that we were able to have dinner with them at Osteria delle Brache. One day in late June, we spent a few hours in Milan and had lunch in the Vittorio Emanuele mall. It was touristy and pricey, yes, but so beautiful! We watched the re-paving of the street in front of our piazza beginning in April. By July, it was awfully hot in the street. This fellow makes his own coffee break! We remembered, from the previous summer, how important it is to get out of the house early and then scurry back into the A/C before completely wilting from the heat. It starts getting really hot about mid July and stays that way for something like 6-8 weeks. The day before our 32nd Anniversary, I went to my local hair stylist and, because of a language misunderstanding, (I guess) I emerged blonde! haha! Oh, well. At least it was summer. August in Florence is almost unbearably hot and humid. We (including Samantha) had a short stay at Borgo i Vicelli, a gem of a tiny resort in Bagno a Ripoli and only a 20 minute taxi ride away. Important, since we don’t have a car! The pool and restaurant at Borgo i Vicelli. Lovely grounds at Borgo i Vicelli. The serene pool at sunset - Borgo i Vicelli. Borgo i Vicelli is family-run, the setting is absolutely divine, the food is amazing, the wine is sourced from nearby, the olive oil is made on-site, and it has a lovely pool and spa. Also, dogs are accepted (see photo above). Highly recommended. 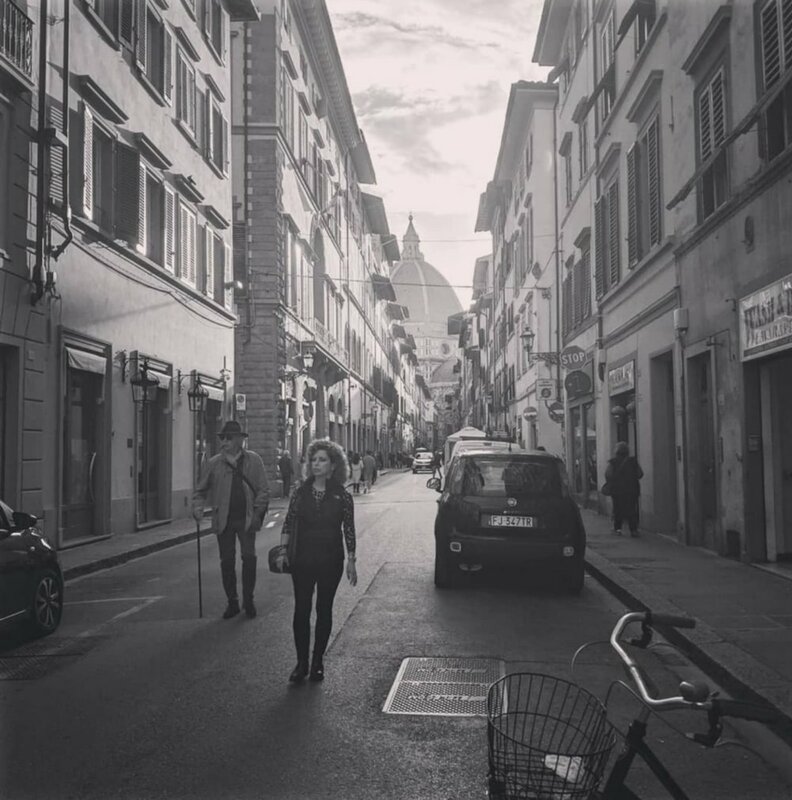 My cherished friend/client/chiropractor, Dr. Vivian Ledesma, had 4 days open between her trip to Romania and before she joined a biking group in The Lakes district - I was overjoyed that she chose to spend it in Florence! She stayed a half block from us in Hotel Liana, so we were neighbors for a few days. Fabulous photo of Viv that Bob took. Scenes from homewares store Riccardo Barthel. I showed Viv all around MY Florence: my favorite clothing store, homewares store, Oltrarno enoteca, cafe, and both mercati (Sant’Ambrogio and Mercato Centrale). Great photo Viv took in Mercato Sant’Ambrogio. ….and we cooked zucchini flowers! ….and after cooking. They were delicious, even though this photo doesn’t do them justice - ha! In September I had yet another Permesso di Soggiorno complication, but it was resolved and I enrolled in more Italian classes. We had visitors and good news! In the beginning of October, Lisa and Paul, our niece and her husband, stopped by for a brief visit. My stepbrother, Jay, and his wife, Joan included Florence in their 5 week stay in Italy. Bob waiting for me to return from Palazzo Vecchio with good news. One week later - he’s an Italian citizen! …AND Bob received his Italian citizenship recognition! It was a big, big month!! The weather became colder, though not bitterly cold, yet. I decided to make Ringraziamento (Thanksgiving) dinner and we were delighted to have guests from Seattle, Susan and her daughter Jen, and our new friends from Scotland, Ellen and her daughter Frances, join us. At Mercato Sant’Ambrogio ordering our tacchino for Ringraziamento. (Yes, dogs are allowed inside…) The tacchino (turkey), which I thought would be the most daunting part to track down, was actually the easiest. Finding cranberries was another story. Eventually, I rehydrated dried mirtilli rossi (cranberries) to make my favorite Silver Palette cranberry sauce recipe. The tacchino JUST fit in the oven! Dessert: Pecan chocolate pie, which I made, and a divine Pavlova prepared by our guest, Ellen. A good time was had by all! Susan, Jen, Ellen, me, Frances, Nick. Bob was here, too, but behind the camera. Ok, by now the weather was quite bitterly cold in the mornings. Sometimes it remains that way throughout the day but every so often it’s quite pleasant. Christmas decorations are everywhere, the Mercato di Natale (Christmas market) at Piazza Santa Croce is in full swing, and Vin Brûlée (mulled wine) is offered almost everywhere - even in our kitchen! Via Tornabuoni, home to fabulous luxury fashion houses, such as Gucci, Ferragamo, Prada, and many more. Photo taken by Nick. As I unpacked the Christmas decorations I had shipped over in our container the prior spring, I was surprised how I misremembered the small amount I had packed and had to be inventive. We didn’t have a traditional tree….or a mantle over which to hang the stockings. The stockings were hung by the stairwell with care…. But we did enjoy the beautiful seasonal clutter! Thank goodness I sent over lots of small Christmas decorations! Bob discovered the fun of buying wine in bulk and it gave him great joy to make personalized labels and drop them off as Christmas gifts. Just before Christmas, our new but already dear friends, Ellen and Frances, moved to France. We tried to help them as much as possible, even though it was sad for us - we miss them! Posted on January 17, 2019 by Jann Placentia and filed under Holiday, Firenze and tagged Mercato Centrale Borgo i Vicelli Permesso di Soggiorno Milan Shopping Thanksgiving citizenship Recipes Enoteca Pitti Gola Mercato Sant'Ambrogio Christmas Decorations Mercato di Natale Friends & Family Osteria delle Brache. "Happy Holidays to all my friends" (and family)!! Paris. A "tree" of macarons! Almost like being there - ha! There will be a full moon this Christmas so I hope you'll keep your eyes peeled for Santa! Posted on December 21, 2015 by Jann Placentia and filed under Holiday and tagged Christmas France Italy.